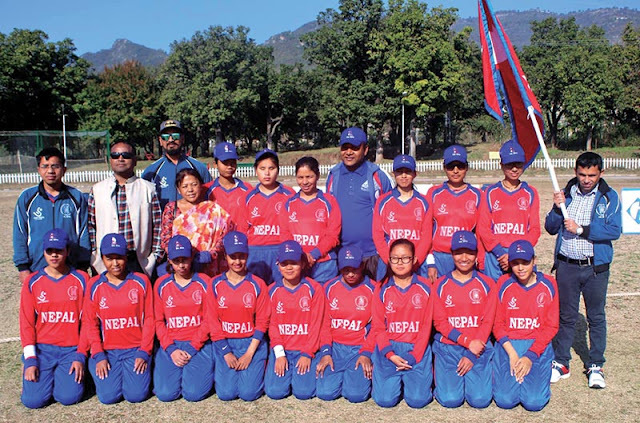 Nepal defeated Pakistan by nine wickets in the fourth match of the International Women’s Blind Cricket Series at the Shalimar Cricket Grounds in Islamabad today. With the win, Nepal took an unassailable 3-0 lead in the five-match series with one match to play. Nepal had thrashed Pakistan by 10 wickets in the first and third matches, while the second one was washed out. The two teams will play the final match on Monday in Islamabad. On Sunday, Pakistan posted 102-7 in 20 overs after electing to bat first, while Nepal raced to the target losing one wicket in just 8.5 overs. Bimala Rai top scored for Nepal with an unbeaten 42 off just 15 balls that included nine boundaries, while Muna Aryal scored 28-ball 22 hitting one four before being run out becoming the first wicket to fall so far in the Pakistan tour. Opener Mankeshi Chaudhary scored an unbeaten 25 off 13 balls that included five boundaries. Earlier, Kiran was the top scorer for the home side with 16 off 23 balls, while opener Tayyaba Fatima scored 13. Muna Aryal, Aayushma Chhetry and stand-in skipper Binita Rai took one wicket each. Rai led the team in place of regular skipper Bhagawati Bhattarai, who was rested for the match. Three Nepali players, Sushma Tamang, Aashika Dhungana and Aayushma Chhetry made their national team debut from the match. Nepal’s Bimala Rai was declared the player of the match and she received 15,000 Pakistani rupees, while her teammate Muna Arya was named the valuable player and she got Rs 5,000.